Tomorrow is National Banana Bread Day so hopefully you have brown bananas sitting on your counter. If you don’t, try to buy some over ripe bananas at the grocery store or knock on your neighbors door. I am sure they will give you their brown bananas as long as you promise to share your bread:) You NEED to bake banana bread tomorrow! I love baking Buttermilk Banana Bread or Whole Wheat Roasted Banana Bread, but since it is a holiday I created an extra special banana bread recipe-Biscoff Banana Bread with Biscoff Cookie Streusel. You better believe I put Biscoff Spread AND Biscoff Cookies in a loaf of banana bread. Don’t call me crazy, well, you can if you want, but trust me on this one. 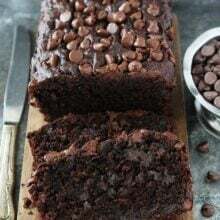 This banana bread is out of this world delicious! If you are a Biscoff fan, you are going to swoon over this recipe. 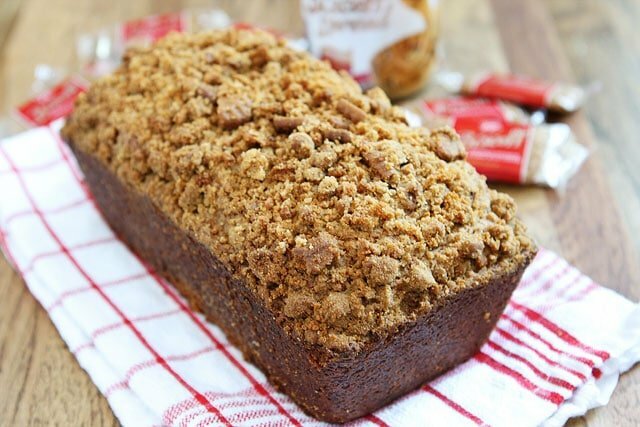 The Biscoff Streusel adds a nice crunch to the banana bread. If you are a Biscoff lover like me, spread Biscoff Spread on your warm slice of banana bread instead of butter. It melts into the banana bread and brings out the Biscoff flavor even more. You can never have too much Biscoff! 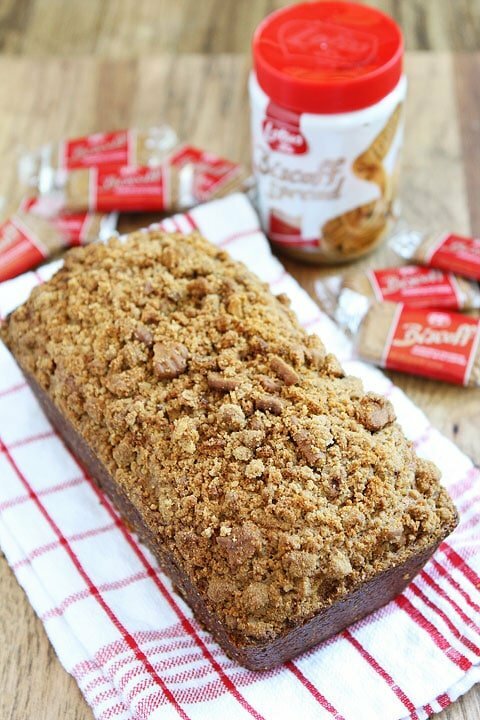 Celebrate National Banana Bread Day with Biscoff Banana Bread with Biscoff Cookie Streusel. I know I am baking up a loaf tomorrow! Maybe I will bake two loaves so I can share the banana bread love. Banana bread always makes a great gift and this bread is the perfect weekend treat! I can’t wait to enjoy a slice slathered with Biscoff. Hurry up tomorrow! Banana bread with Biscoff Spread and a sweet Biscoff Cookie streusel topping. 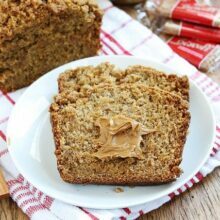 Biscoff lovers will love this fun banana bread! Preheat oven to 350 degrees F. Grease a 8x4 loaf pan and set aside. 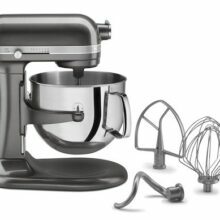 In a medium bowl, whisk together the flour, baking soda, baking powder, cinnamon, and salt, set aside. In a large bowl, stir together your mashed bananas, Biscoff Spread, canola oil, egg, vanilla, and sugars. Add the dry ingredients into your wet ingredients and stir until just combined. Batter will be slightly lumpy, don't over mix. Spread batter into prepared pan. In a small bowl, combine chopped Biscoff cookies, flour, brown sugar, cinnamon, and melted butter. Stir until combined. Sprinkle the streusel evenly over the batter in the loaf pan. 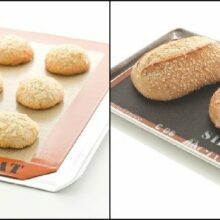 Bake bread for 55-60 minutes or until toothpick inserted into center comes out clean. If the top starts to brown before the bread is done baking, place aluminum foil loosely over the bread and finish baking. Let the bread cool in the pan for 10 minutes. Loosen the edges of the pan with a knife and remove from loaf pan, transferring bread to a cooling rack and cool completely before slicing. Note-you can also use Trader Joe's Cookie Butter in place of the Biscoff Spread. I just posted a big roundup of 30 of my favorite banana bread and banana recipes. Other than Natl PB Day, I love this holiday 🙂 And I love Biscoff and streusel topping. Gorgeous bread, Maria! Happy holiday! I’ve never had Biscoff spread, I believe it’s peanut and tree nut friendly…Happy Banana Bread Day. Does Hallmark know of this? I think I’m late to the game — I need to try this Biscoff spread, and I didn’t realize this was a “holiday”! 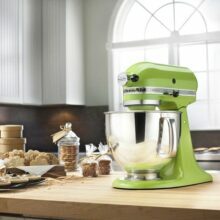 Any quick bread that includes cookies must be good, too! This banana bread looks amazing, however as far as I know, we don’t have biscoff cookies in Australia. What is another cookie that you think would be a suitable substitution?? Hot dam does this bread look good! I am loving it!! Great idea!! Yeah! I am so glad you shared a biscoff recipe! I won, yes I won, a case of Biscoff spread! I received it last week and have been trying to find ways to use it. I like it as a treat on graham crackers, but having a case, I need to use it in other ways! Thank you so much and if there are more recipes, please send them my way! I love biscoff and would love to try it in banana bread. Great idea! Oh good heavens. We really love banana bread. If margaritas have a holiday (today), certainly banana bread needs one too. I have 2 favorite banana bread recipes. One is a muffin and one is a pancake. HA! I have been putting of trying Biscoff spread, as Nutella and I get along so well that we have to be kept apart. I have a feeling Biscoff and I will be fast friends too. Looks incredible, Maria!! Love the combo of cookie butter and banana. You know how incredible I think this is? So very much. Love that topping too! I just tried Biscoff spread for the first time and I am hooked! I put it in my oatmeal this morning! Yes please, at this very second! Love!! Fabulous! I know I will love this bread! I have the bananas, but my biscoff jar is almost empty 🙁 Sounds like I need to go to the store today! Yum! 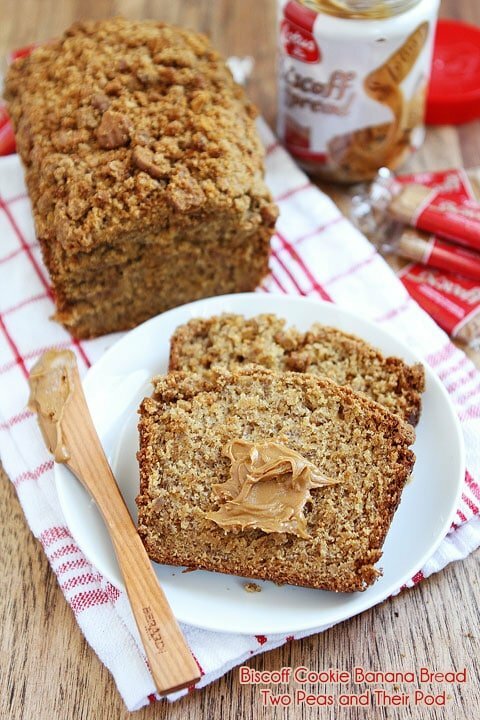 I love banana bread and ANYTHING with Biscoff in it- this looks to die for! I’m so happy we were able to meet each other at BYBC13! I love a good banana bread…this recipe puts a yummy sounding twist on the traditional version, can’t wait to try it. I want a big hunkin slice! Awesome banana bread, Maria. I love the soft texture of bananas with a crunchy streusel topping! Holy moley I am so glad I have over ripe bananas now. This will be made tomorrow and I am pretty sure I just might eat the entire thing!! Mmm! This rocks my socks! Oh my, the topping sounds amazing! Can’t wait to try this banana bread! HOLY-wow, can I please come over!! Biscoff does have a way of making everything better, doesn’t it? what a gorgeous loaf! Love that you used Biscoff cookies in the streusel topping!! This is my kind of bread. Great idea to add the crushed cookies in the topping. I need to get with it with these holidays! I totally did not know about that. Is this the bread you and I were chatting about several months ago?? And how we made pretty much the same thing?? Yours looks AMAZING!!! yum- seriously, i need some biscoff asap!! Where do people hear about all these national food holidays?? I love food, and I feel left out. (sigh) I’ll be making banana bread something as I have plenty of ripe ones laying on the counter! I have got to try Biscoff. I see it at the grocery store all the time and don’t know why I keep putting it off. I’m definitely getting some next grocery shopping trip! This is the best banana bread ever!! I love the combo of banana and biscoff.. i have the speculoos cookie butter and I love it for breakfast. Very cool idea of how you incorporated the 2 in a bread. Btw, I just had a great idea. How about Biscoff pancakes?! Yum! My husband has started eating the browning bananas. It is a tragedy in my eyes. I am going to start buying double. Hopefully he won’t start eating double. What a wonderful idea, sounds great Maria! You know, I’ve never tried Biscoff?! When I finally get my hands on it, I’ll be making this recipe – looks so good! I love banana bread. And I DOUBLE-Y love Biscoff spread. Genius! Oh man, you are killing me with this. 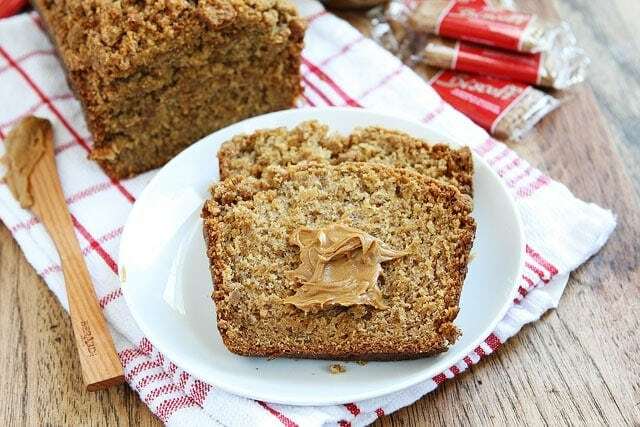 I was only introduced to Biscoff around Thanksgiving, I feel like I have to make up for lost time and this banana bread is a great way to do it! What a yummy twist on banana bread. Yummy! I just made this recipe, but I made it into 30 mini muffins instead of a loaf….the kids are loving them. Thanks for the great recipe! Maria this has my name all over it! – I need to pull some bananas out of the freezer right now! I LOVE Biscoff and can not wait to try this banana bread!!! I made this last night. I didn’t have any Biscoff cookies, so instead of the streusel, I added some cinnamon chips to the batter. Really yummy, thanks! I just pulled a loaf of banana bread out of the oven sans streusel or biscoff…Next time I bake a loaf, I’m definitely trying your version! Whenever I click on a recipe that looks interesting on Tastepotting, at least half the time its one of your recipes…can’t wait to try this one for the kids. Thanks! Great recipe, I have yet to try Biscoff spread but my roommate is OBSESSED! I bet she will loveee this bread. I made this last night, but to be honest I was underwhelmed. While it was objectively delicious, all of the banana bread taste was gone and it just tasted like carrot cake. There wasn’t much special about it. I made this for my Mom. She said it was the best banana bread she ever had. 🙂 Thanks. Truly Awesome..just looking like a divine! This looks like a yummy twist on an old favorite. I’ll have make this tomorrow. Thank you for the gluten free recipes. Unfortunately, Biscoff is not GF, but my family will like this quick bread. and the result, my my my! my kitchen was smelling like autumn treat! the bread turned out so nice and tasted so good! thanks so much again! really loving your site! im hooked! Glad you liked the bread! Hi! Has anyone tried another oil other than than canola? I have vegetable, cocount and peanut…. Vegetable or melted coconut oil will work. Enjoy! Made it and it was delicious…. the whole family loved it.